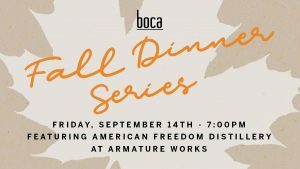 Join us on Friday, September 14th in the Armature Works Show + Tell Kitchen for a decadent four-course dinner complete with Horse Soldier Bourbon and Rekker Rum pairings. Scott Neil, from the American Distillery Team, will be joining us to share some incredible stories from his years as a Special Forces team member. $80 per person; seating is limited. For reservations, please give us a call at 813-254-7070.